This Cake Decorating Kit will empower you to make flawlessly adorned cakes, treats and different regards and it's simple as 1-2-3! 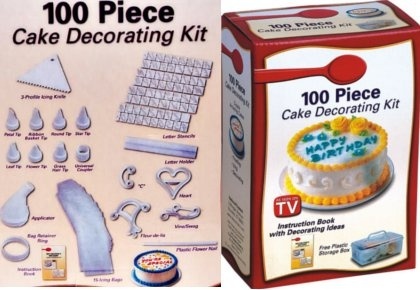 With your creativity, you'll be making astonishing treats that will awe and joy your family and friends.This phenomenal 100 piece cake enlivening set will give the premise to boundless embellishing from the most fundamental to the most developed. Turned into a professional cake decorater with included letter stencils, blossom tip styles, icing chiseling searches and design presses for making a wide cluster of impacts - the key is the mulitdirectional applicator. Fill a bag, pick a tip, crush and plan the cake to your joy.